Returning the World's First Fighting Jet to the Skies. Few aircraft in history have fired the imagination like the Messerschmitt Me 262. Born of the desperate circumstances of war, this masterpiece of technology and innovation forever changed the face of aviation when it first appeared in the skies over Europe in 1944. Considering the short operational life of the aircraft in an already lost cause, the popularity of the Me 262 has endured with surprising fervor. Still, despite the obvious interest, none of these planes have taken to the skies in well over 50 years. The few originals (less than 10 worldwide) that still exist are now cloistered in museums, never to fly again. They are so rare and so valuable that to risk them in their natural element is considered by many to be nothing short of foolhardy. None are even close to being in airworthy condition. To see an Me 262 streaking through the sky again would seem to be a daydream ... until now! The Me 262 Project was launched in 1993 with a single objective: to reproduce flying examples of the legendary Me 262. Classic Fighter Industries, Incorporated (CFII) was incorporated specifically to administer this effort, and exercised direct control over the project from 1993 until early 2001, when all assets were transferred to the owner's group in preparation for final assembly, the test flight programs, and delivery. Production has been strictly limited to five aircraft: once these five are complete, no more will ever be produced, now or in the future. 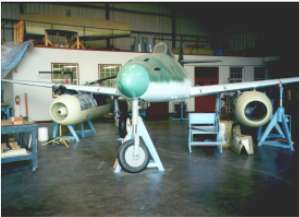 The airplanes are being manufactured as a continuation of the basic Me 262 design. In fact, they have even been assigned factory serial numbers drawn from the werknummern sequences used on the original 1945 production lines. Great pains are being taken to produce aircraft which are not simply replicas, but rather true serial production representative aircraft in every possible respect. Virtually rivet for rivet, the new aircraft are duplicates of the original Me 262. With the ability to examine and copy components from a vintage source, the standard of authenticity has been exactingly maintained. Of course, the original design suffered from some well-known weaknesses, most notably dealing with the engines and landing gear systems. These areas were studied carefully, and certain subtle modifications have been directed for operator safety and reliability. A cursory visual inspection would never reveal them, however, as these internal modifications have been tightly integrated into the original design characteristics of the aircraft. In essence, the new Me 262s are simply representative of a natural evolution of the airframe. They are being manufactured using many of the same techniques as the originals (by hand from raw materials), and are to be precision duplicates, even down to the four nose-mounted Mk 108 cannons. The only noteworthy concession will be in the area of engine selection. Clearly, an engine change was necessary to make this project viable, as the original Jumo 004B powerplants were decidedly temperamental and prone to frequent failure. After careful consideration of a wide variety of available engines, the General Electric J-85 / CJ-610 was selected as the replacement for the vintage Jumo powerplants. Thanks to an innovative engine mounting concept, the J-85s are to be buried deep inside carefully-engineered castings of the original engine, so that correct visual appearance will be retained. The Jumo housings are also necessary to maintain the correct nacelle weight since the J-85 is a much lighter engine than its German predecessor. � 2006 Sabre Design Group. All rights reserved.